The traditional arts and crafts that are practiced on the island are those of textile weaving, pottery making and wood sculpting. 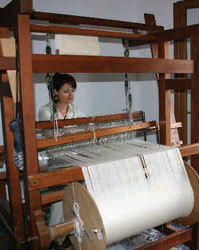 Naxos, in fact, holds a significant tradition in textile weaving. Until recently almost every household in Naxos’ mountain villages was equipped with a loom, called the “krevataria” in local dialect. In Moni, in Apeiranthos, and in Komiaki, one can find women weavers’ work­shops who maintain ongoing exhibitions, showcasing their works. Pottery has also been blooming on the island during the last few years, in Chora as well as the islands’ villages. In the central square of Chalki, in an old building dating back to 1869 the gallery area / workshop “ELAIA” is housed, owned and run by the esteemed ceramist Katharina Bolesch. Her source of inspiration and basic subject matter/theme of her works is the olive. The pieces seen here are all handmade. Works of the artist are shown at several exhibitions. In the same area, in the village of Damalas, we find the workshop of Manolis Limbertas. Located in the village of Moni we find a wood sculpture workshop. In many wood­working shops, on the island, old artisans practice traditional Naxian wood crafting, focusing especially in furniture making. 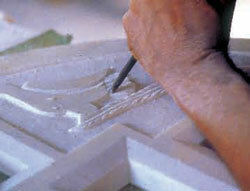 Recently workshops of marble sculpture and folklore items are developing on the island. During the last few years a number of talented artisans/jewelers have been living and working on the island, creating marvelous jewelry collections. In Naxos’ jewelry shops you will find additionally jewelry with the fa­mous “Eye of Naxos” a unique shell, which is said to bring luck. Many other traditional crafts have been kept alive and in practice till recently, though are on the verge of extinction. 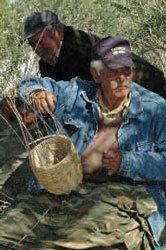 Such are basket weaving, a craft mainly practiced by retirees in villages such as Keramoti, and traditional instrument fastening in Koronos, Filoti, and other villages.